Singer and actor Michael-David Gordon is a dynamic entertainer who explores standards, pop, and R&B, drawing on his experience singing with the Temptations, acting with Irondale Ensemble Project, and fronting the Pocket Band, featured in one of Times Square’s most successful restaurants. Michael-David will premiere his new quartet at the Inkwell Friday, July 11. The group, which includes John Landers, piano; Pierre Morquart, bass; and Hollis Headrick, drums; is equally at home with music from Cee Lo Green to Duke Ellington to Bruno Mars to Otis Redding. 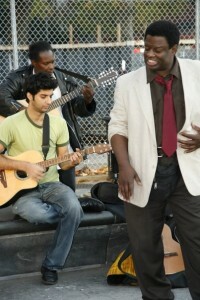 Michael-David’s vibe is accessible, funky, swinging and always fun! Click here: Benny and the Jets – Michael-David Gordon on Vimeo for a sample of Michael-David performing a tune we know well at Washington Square Park in Greenwich Village. Please join us Friday, July 11, 7-9 pm, for an exciting evening of music when the Michael-David Gordon Quartet performs at the Ink Well Cafe, 408 Rogers Ave, between Lefferts and Sterling. Your $5 donation (or more, or less) supports the musicians and PLG Arts! This event is made possible with public funds from the Decentralization Program of the NY State Council on the Arts, administered in Kings County by Brooklyn Arts Council (BAC). And be sure to try the Inkwell’s new expanded menu plus soul food selections, fine wines and beers.